As we continue to celebrate National Archives Month, we’re sharing some ephemera from Ohioana’s archival collections. Although these items were designed to be thrown away after they had served their purpose, paper can be surprisingly resilient. Today they provide a unique, often fun, and sometimes beautiful glimpse of everyday life. 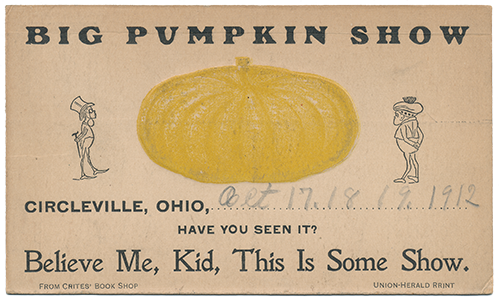 Because the 2013 Circleville Pumpkin Show is now history, we thought we’d share this postcard promoting the 1912 show. Although it’s difficult to see in this image, the pumpkin is embossed. Note that the postcard was provided by Crites’ Book Shop and printed by the Circleville Union-Herald, a weekly newspaper that ran under that title from 1888-1927. 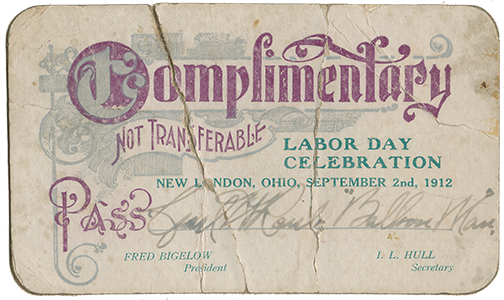 Although this pass for the 1912 New London Labor Day Celebration is not as well-preserved as the postcard above, the beautiful typography is still visible. The 1938 Ohio State Fair ticket shown below was provided by the Ohio State Journal, which began as the Western Intelligencer in 1811. It was central Ohio’s first newspaper, and was published in Worthington with James Kilbourne as its original editor. When Columbus became the state capital, the paper moved downtown and served as the official reporting newspaper of the Ohio General Assembly. After several name and ownership changes, it became known as the Ohio State Journal in 1840. Although the paper became part of the Dispatch Printing Company in 1950, it continued to be printed under the same name until 1959, when it merged with the Columbus Citizen to become the Columbus Citizen-Journal. 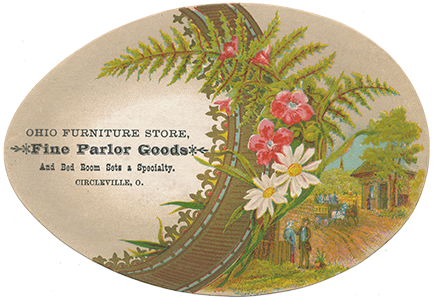 And finally, some advertising ephemera from Circleville.